Glendalough- "Valley of Two Lakes"
Founded in the sixth century when Christianity was still relatively new to Ireland, Glendalough, located in the heart of the Wicklow Mountains, is one of the most intriguing monastic settlements in the country. (There were approximately 800 built in that era through the middle ages.) With two lakes and wooded mountains, its beauty stands arm in arm with all the fascinating stories that originated there--some real, some of legend, some a mixture of the two. Most of the ruins, which include seven churches, a cathedral, several dwellings and a round tower, were built between the 10th and 12th centuries on the eastern expanse of the 2-1/2 mile long valley, the only area not bordered by a mountain. The most distinguishable feature is the 110 foot round tower, a landmark once used by travelers and visitors, as well as by monks seeking refuge during Viking (and later, English) raids. 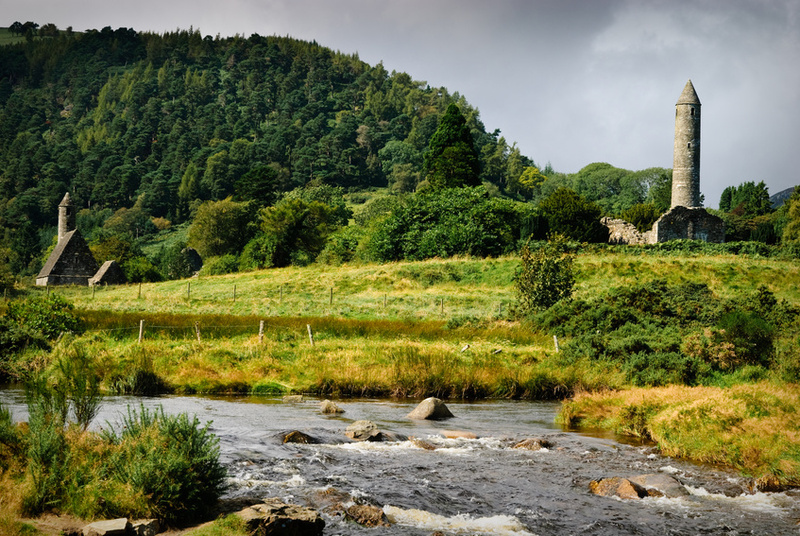 Adding to the allure of this solitary glen is the story of its founder, St. Kevin, a man of noble birth, who at a young age, dedicated his life to God, traveling to Glendalough to become a hermit. He slept in a tiny cave on a cliff at the Upper Lake now called "Kevin's Bed", and his solitary existence and complete reliance on God gained him many followers. Eventually he joined his fellow monks to build the monastery that became a great school of sacred learning, and it is there that he died at the ripe old age of 120 in 618AD. By the end of the 9th century, his settlement had grown into a mountain city, rivaling Clonmacnoise in County Offaly as the leading ecclesiastical center in the country. Kevin's successors perpetuated his belief that anyone seeking shelter should never be turned away, a belief convincingly illustrated by the large cross chiseled into the stone wall inside the entrance affording sanctuary to all who touched it. And of course there are the legends... Most notable is the story of the fair Kathleen who tried to seduce handsome young Kevin in his hermit days. (In Latin, his name means "fair-begotten".) The story varies, but most accounts have the tormented Kevin flinging himself into a bed of nettles and then turning around to scourge Kathleen with the same stinging weeds. The outcome was the surprising repentence of Kathleen, who later demonstrated much piety and virtue herself. "Sky-lark never warbled o'er"... Folklorists say that when Kevin was having the original cathedral built, the laborers agreed to work a full day, vowing to "rise with the lark and lie with the lamb." And yet only after a few weeks the laborers found themselves too exhausted to work. When Kevin investigated the reason for this, he discovered the larks of Glendalough, unlike other larks, started their day several hours earlier. Kevin prayed for a remedy to this conundrum, and from that day forward the skylark never sang in Glendalough again. For visitors, this is a site best hiked in sunshine, or at least in mist-free weather to garner the best views along walking paths connecting both lakes to all the ruins. The visitor center and parking lot are far removed from the actual settlement area, so there's little commercial activity to spoil the timeless atmosphere--aside from kiosks selling maps and postcards outside the original entrance. Allow at least three hours to explore, and don't forget to touch the sanctuary stone!